I only need two. 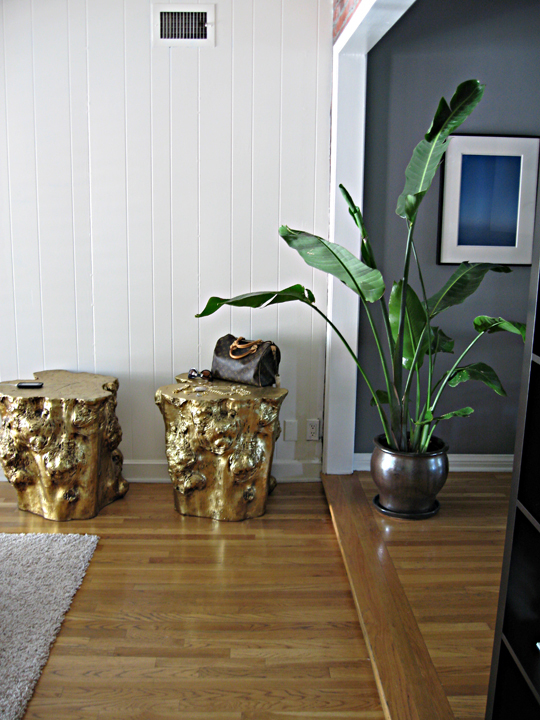 Two gold tree stumps. Who would've ever thought gold spray paint and firewood could sit so pretty? I really, truly love the idea. What do you think? They run a fine line between just-the-perfect-finishing-touch! and oh-no-why-would-she-do-that? I want to hear your feedback before I commit to explaining this idea to my Dad, risking his entire view of me, my taste and style through asking him to find me tree stumps that I will later spray paint and lacquer gold. This is a great idea...and seemingly inexpensive to do it yourself! Thanks. Squeel!!! LOVE LOVE LOVE! DO it!!! (This reminds me so much of that gold herkin' thing I posted about a while ago! )AND I have a chunk of wood I was going to spray paint gold. You first. Hahhhaa. i LOVE it. and love your blog! just found it.